Windy City to Croke Park. Legend. This Sunday will see Limerick take on Galway in a highly-anticipated All-Ireland Final as the Liam MacCarthy cup is up for grabs. Fans are expected to take over the city from as early as Saturday afternoon as extra trains and bus services have been provided for those keen to be up for the match. One of those who'll have travelled a bit further than your average punter is 98-year-old John Hunt. Hunt, originally from Athea, Co Limerick, and now living in Chicago, is a bonafide hurling supporter who is known for travelling great lengths to see his home county play. Hunt – who is a founding member of the Limerick Hurling Club Chicago and honorary president of Chicago GAA – arrived back in Dublin on Friday afternoon to witness his team take on the Tribesmen. 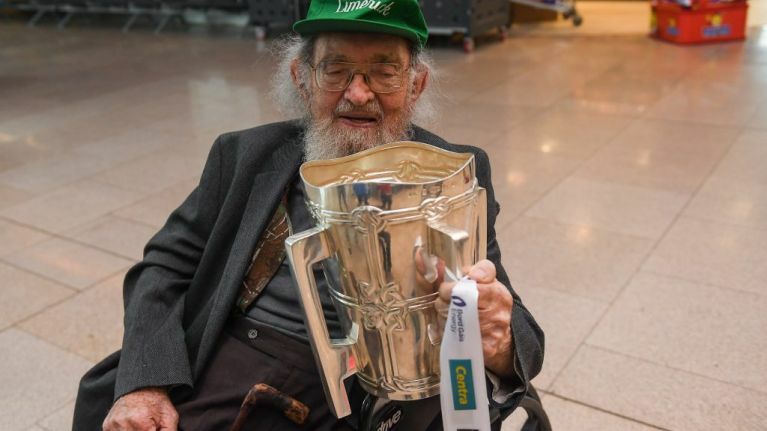 And even though he had to wait through a six-hour delay on his flight home, nothing was stopping the nonagenarian from coming to Croke Park this weekend. Hunt's travels were acknowledged by his home club of Limerick Hurling in Chicago, which he set up some 59 years ago. "Great to see our founding member John Hunt heading to Ireland for the all Ireland hurling final," the post read. "Hopefully we will have another photo of John with the Liam McCarthy cup again on Monday. The best of luck to Limerick and to our former players William O Donoghue and Tom Condon on Sunday. The GAA also took to Twitter to share the news of Hunt's arrival back in town. "98 years young and #HomeForTheMatch! This is John Hunt who’s flown from Chicago to support his native Limerick this Sunday! #BeThereAllTheWay"
It's understood that Hunt has been avidly following Limerick at All-Irelands since 1936. He was there when Limerick won the All-Ireland in 1940, and he'll be there tomorrow, 78 years later. Thousands of Limerick fans are expected to travel to the capital this weekend, with 20,000 seats booked for a special screening of the match at Croke Park this Sunday. Galway take on Limerick this Sunday with a throw-in time of 3.30pm.